Margaret Whitlam has been honored by the National Aboretum today when they named their new events pavilion after the late author, reports ABC News. Mrs Whitlam was well-known as the wife of former prime minister Gough Whitlam, and was recognised in her own right as one of Australia’s national treasures. She was a published author, social worker and former champion swimmer, having represented Australia at the 1938 British Empire Games in Sydney. Mrs Whitlam died in 2012 aged 92 years old. Nicholas and Judy Whitlam attended Monday’s official opening ceremony near the Arboretum amphitheatre. The Margaret Whitlam Pavilion will be used for events and functions at the tree park. I would have thought that naming the pavilion after someone like Thomas Weston, who established the first plantations of trees in Canberra, would have been considered far more appropriate. He was (temporarily) banned from being a company director, as he was “not a fit and proper person to run a company”. What a ratbag he is, and I have no idea why the ACT would be involving him in our arboretum. So poor fiscal responsibility and a lack business acumen runs in the family? It certainly runs in the Territory Government “family”. Labor largesse extends to its corpses! AND Labor largesse extends to its copses! The whole thing is a joke, a facility that charges $200 a photo is so far out of touch with the real world should be named after another out of touch with reality person, “What’s inflation” M. Whitlam. ‘…so far out of touch with the real world…’ – Couldn’t agree more. Anyone tried to book a function at this place? I did, and gave up not too long afterwards due to their amazing lack of customer service. Real pity as I think the location is fantastic and the Pavilion is a beautiful site for special occasions – I just don’t think the management will do it justice. Good point… so The Hoo-Ha Pavilion it is then. 😀 Wonderful tribute to a wonderful person. I am sure she was a wonderful person but it just does not seem approriate to honour her in this way as she has little connection with Canberra and zero with the Arboretum. Perhaps you can explain why it is a wonderful tribute to her? 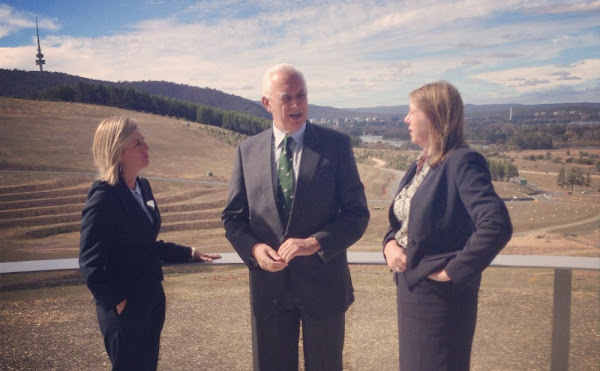 Yay, the Whitlam-cult continues – paid for by the kind taxpayers of the ACT! So, do you exit the Margaret Whitlam Pavilion through the John Kerr Memorial doors?? Evil comment by Mr Evil himself. Based on the photograph, one may wonder if a more pressing issue is the fact that the arboretum appears to be lacking actual trees. I’ve been saying that for sometime actually. Despite Whitlam’s aura of caring for the little people, they were as expendable to him as to any other politician. So as one of those expendable little nobodies I could do without seeing the Whitlam name attached to venues around my hometown. But apart from that, I really don’t see the relevance anyway. Menzies Walk is fair enough. Off the top of my head wasn’t Menzies quite involved in Canberra developing from an artificially created city to a place people call home? I remember a story about his daughter complaining about the lack of footpaths making it difficult to get around with the pram? So naming a footpath in the Parliamentary Triangle after him seems appropriate. I’m going to check dungfungus’s link to see I’m right. The better choices for a name for the arboretum pavillion in my opinion would have been either Marion Mahony Griffin, someone with a connection to botany or Canberra’s history or both, or a relevant indigenous name. This sets an undesirable precedent. The place is supposed to be an arboretum not a memorial theme park for apolitical figures. If buildings have to be named why can’t people with a botanical or Canberra-centric background be recognised? What has Margaret Whitlam ever done for Canberra apart from being a part time resident here? I wasn’t aware she was an author either. This move ensures the naming of other buildings there will be overweighted with people from the non-conservative side of politics. I can just imagine “The Bob Brown Biodegradable Toilet Pavillion” etc. a long overdue memorial to Marion Griffin. Another good suggestion, particularly given Marion Griffin’s aesthetic appreciation of the Canberra landscape. Another option might have been a suitable indigenous name. Maybe a nice quiet stroll along the R G Menzies Memorial Walk by the lake might help give this none-issue some perspective. It’s a bit of long bow to compare Margaret Whitlam’s contribution to Canberra to that of Menzies.